Tall men and women dressed in black suits, wearing sunglasses, and carrying guns while talking on walkie-talkies is probably the image that comes into mind for most people when they hear 'bodyguard'. In reality, however, there is much more to being a security guard than cool appearance. To experience and uncover all that is hidden behind being a security guard, four SMT reporters participated in the first annual Security Service Experience Camp for University Students hosted by the Presidential Security Service (PSS) this summer. 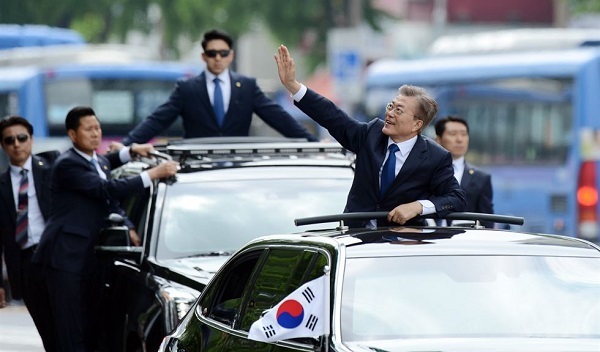 With the change in South Korea’s administration this past May and the newly elected President Moon Jaein taking office, much of the South Korean government, as well as the nation, have felt the effects. Besides social and political changes, security has also seen change. President Moon pursues “low and open security service”. That is, he seeks citizen-friendly and actively-communicating security. His new policy has brought about major changes in the method of presidential and other VIP escorts for the PSS. The newly adopted protection method also extends to the safety and security of civilians. To promote the new vision for PSS among the public in terms of the work of a presidential security guard and actually getting low and open, the PSS chose to target university students and hosted the 2017 Security Service Experience Camp for University Students. The Camp took place over two days, from August 28 to 29. 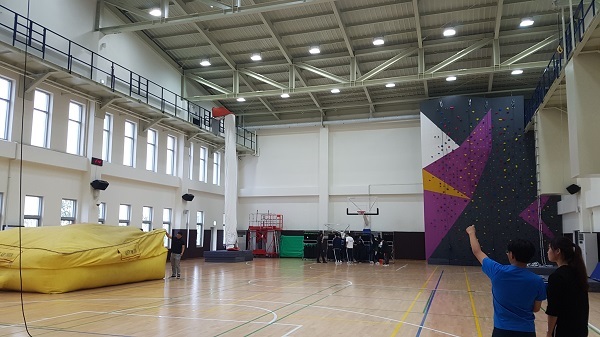 Campers experienced actual security training at the PSS Training Center, located near Gimpo International Airport. The entire two-day itinerary was so well organized and executed that it was hard to believe that the Camp was the first of its kind. In order to all arrive at the PSS Training Center at the same time, SMT reporters and two Sookmyung Press reporters met at Seoul Station. Later, students from other universities arrived at the station as well. A bit of chaotic scurrying occurred as we all tried to find the bus to the PSS Training Center. However, upon finding the proper bus, two presidential security guards greeted us. They were friendly, kind and seemed more like close older siblings than drill instructors. Another interesting fact was the location of the PSS Training Center. Nearing the Center, we could only see endless fields of grass. This SMT reporter was a bit taken back by the idea that a presidential department would set up its facilities in such a barren place. However, when the Training Center came into view, it was enormous. Immediately after arriving, we were directed to the dormitory rooms that we would use for the next two days. Again, even the sleeping quarters were impressive for this reporter. Some of the most memorable activities were the darkroom, descending life line, and rotating car. The darkroom activity involves entering a completely dark space, devote of any light at all. The PSS Training Center created such a space in order to train guards for cases of blackouts. Campers had to enter and find their way to the exit without speaking to each other. Prior to entering, the security guards said that firefighters were the best at this activity and could escape the room in less than five minutes. However, the average of the campers was over thirty minutes, which shows how difficult it is for ordinary people. The task of moving down a descending life line was held in the Multi-Purpose Training Gym. Everyone got a chance to go down the descending life line, which simulated an escape from an apartment during a fire, relying solely on a rope. Another activity that is only available at the Center is being in a turned over vehicle and escaping though the window when it was overturned. The purpose of this training was to show the importance of seat belts and how they save people’s lives in car accidents. The car attached to the custom-made rotating machine was turned over four times with campers inside wearing seat belts. The seat belts tightly held and kept everyone in their seats as the car turned over. When the car stopped turning over, passengers had to escape through an open window as one should in a real accident. Also, the recreational games in the evening were amazing. 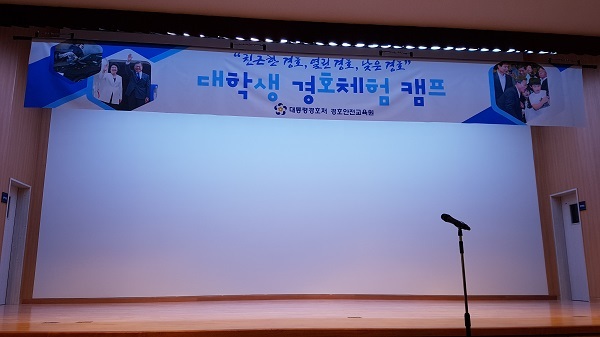 Kwon Feel, a comedian, was invited to the Camp to host the evening of fun. He prepared many entertaining games for campers to enjoy and get closer to one another. 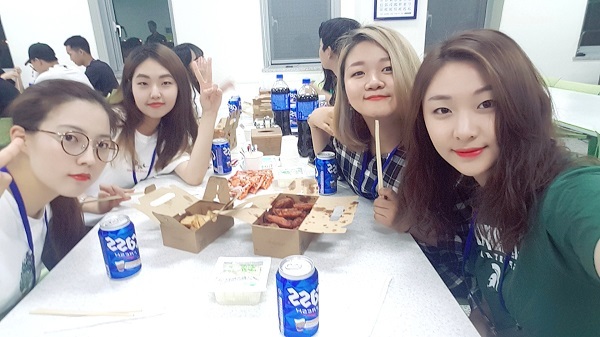 However, the best part of the evening was the sharing of fried chicken and beer with everyone. At the end of the two-day camp, everyone became close, so it was hard to say goodbye. Everyone got together and took a final group picture and promised to meet again. During one of the lectures given at the Camp, one presidential security guard said, “One does not become a security guard to earn a living, but to train and learn to make the ultimate sacrifice of death to save others. Every guard knows that death could be their fate.” These words had a profound impact on this SMT reporter. How beautiful is the spirit of self-sacrifice of presidential security guards! All SMT reporters who took part in the camp know that they were part of something great. It was a once in a life time experience.